Goddess Religion means devotion to the Supreme Deity in Her original feminine Form. Or perhaps in one of Her many forms. There are many goddess images – so is there one Goddess, or are there many? Does Goddess Spirituality actually mean devotion to a single Being, or are there many Goddess Religions? The answer to this question lies in the fundamental ambiguity inherent in the word "goddess". The difference between "God" (meaning the Supreme Being) and "a god" (meaning a superhuman being) is clear enough in most people's minds; but among those who speak of "the Goddess" there is often a confusion of the two usages. It is for that reason that we tend to use the term Mother God – not only because "Goddess" sounds like a feminisation of "God": as if the masculine god-image were the original, which is the reverse of the truth – but also to make it clear that we are speaking of the Supreme Being in Her original feminine Form – not simply of a superhuman or angelic being. This certainly makes matters a lot clearer, but it is still something of a simplification. The earliest European creation story tells how the Supreme Mother created the world. Her first Act after separating the waters from the sky was to create the Seven Powers who would rule the seven fundamental aspects of being. 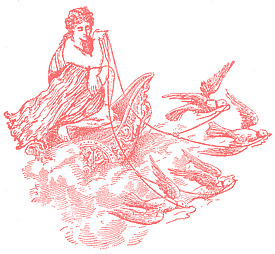 Originally, of course, these seven Powers were feminine: the first and greatest Goddesses as opposed to God Herself. Later patriarchal and semi-patriarchal cultures invented male gods to go with the primordial Goddesses, and later still most or all of the feminine Powers were replaced by masculine ones (all seven are masculine in the patriarchal Indian tradition – in the patriarchal classical tradition, only Venus and the Moon remain feminine). 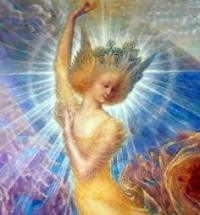 These seven Powers – Angels or Goddesses – govern the seven fundamental divisions of being. That is why "sacred sevens" are found throughout human culture – the seven days of the week, the seven colors of the rainbow, the seven deadly sins (which are the perversions of the seven fundamental good qualities that run through all being, human and otherwise – it is a reflection of the negativity of patriarchal culture that the seven sins are better known than the seven virtues!) and many others. These seven fundamental Powers are known to many Déanists as Janyati. This word can be translated as either "Angel" or "Goddess". Many favour "angel", but we would suggest that "Goddess" is actually the most perfect term, and that the correct and exact meaning of Goddess Religion is the worship of one or more of these fundamental Goddesses. Why is the word Goddess so exact? Because the seven Janyati are aspects of God Herself. Just as the pure light of the sun is without color, but refracts into the seven colors of the rainbow when it passes through a drop of water, so the Supernal Light that is Dea refracts into Her Seven Powers, or "Goddesses", as it touches the waters of manifestation. Even the Feminine Holy Trinity Itself may be seen in the light of the Seven fundamental Goddess-forms: for the seven divide naturally into the Three (the number of Spirit) and the Four (the number of matter, or manifestation). And, as we shall see, the Three correspond closely to the Persons of the Trinity, or "triple-goddess". Each of the fundamental Goddess-forms requires an Essay to Herself, but we shall take give a very brief look at each and how she fits into the overall Goddess Religion. We use here the Déanic Names. At the highest level, as the central Goddess of the Heavenly Three, Sai Raya represents the Solar Mother Herself. Hence she was called by the ancient Greeks Theia, which means simply God. 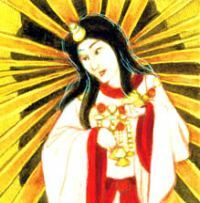 At a lower (manifest) level, she represents all the golden fecundity of the Solar Principle and gives health, abundance and life to all creation. Some Goddesses-images of Sai Raya: Amaterasu, the Japanese Sun-goddess. Sunna the German Sun-goddess (who gives us our word "Sun"). All other Sun-goddesses Our Lady Mary as "the Woman Clothed in the Sun". At the Highest Level, Sai Candré represents the Daughter, who mediates the Solar Light of the Mother ("Whose brightness is to great for us to look upon") to the creatures of the earth. At a lower, manifest level, she represents the lunar influence of mercy and governs the spheres of imagination and the subtle and psychic domains. The moon is the intermediary between Heaven (Sun) and Earth, mediating the light of the Mother which is "too bright for us to look upon". Thus the moon governs the Priestess function, both divine and human. The lunar principle also characterises maid herself, standing as she does between earth and heaven and acting (if she is fulfilling her true function) as mediatrix of the Divine light to the created world. The sphere of the moon is the lowest of the celestial spheres: thus all that is sublunary – "below the moon" is physical, while the subtle realms in immediate contact with the physical domain are lunary. 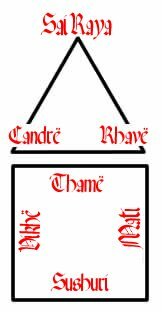 All these things are within the domain of Sai Candré. 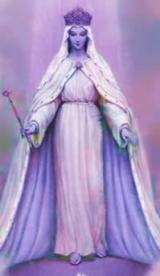 Some Goddesses-images of Sai Candré: Kuan Yin, as saviouress; Artemis and other moon-goddesses. With Sai Vikhë we are among the Four Goddess forms that are more closely connected with manifestation (the other of the Three is Sai Rhavë, who comes last on this list, for she is last from the manifest point of view and first form the unmanifest). Sai Vikhë is the principle of discord or combat that is always inherent in manifestation: for only Heavenly things are in perfect harmony. If there were no discord, there would be no universe. However, in the Goddess Religion, all discord is but part of the Greater Harmony. War is not part of the culture centred on Goddess Spirituality, but when it is necessary to defend, the courage of Sai Vikhë comes to the fore. At the earthly level, Sai Vikhë governs all military activity, as well as all conflict and defence. The Vikhelic principle is strong in masculine beings, and, in its unbalanced form, gives rise to patriarchy and war. However, the Vikhelic principle also exists in feminine societies, and is a vital – and, provided it is not unbalanced, a noble – aspect of the manifest world. There are two main paths to the Absolute, or Dea: jnana marga, the Path of Light, or Wisdom and bhakti marga, the Path of Love, or devotion. Sai Mati represents the Path of Light; and, at her highest level, (where, like each Goddess, she unites with God Herself) the Divine Light or Intelligence. Sai Mati's yellow or saffron hue reflects that of Sai Raya, for the Intellect is inherently solar. Thus, from a certain perspective, Sai Mati is the "lesser Sun": although as with all Goddesses, or Janyati, in her highest aspect, as the Divine Intellect , she is one with the Supreme Being Herself. In earthly terms, Sai Mati governs all intellectual activity as well as all communication. A lesser form of Sai Mati is Nimwé the trickster. 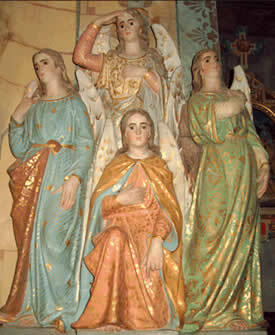 Some Goddesses-images of Sai Mati: Sophia, Hebrew Hokmah, Athene (as Wisdom), Saraswati (as Learning/Wisdom) Our Lady Mary as Sedes Sapientiae (Seat of Wisdom). Sai Thamë is the Divine Harmony: the Golden Order. Ultimately she is Cosmos (order) as opposed to Chaos, and thus the very principle of Creation (see Cosmetic Philosophy). Her name is often used with a small 't' to mean the earthly principle of order, so we speak of the thamë of a civilisation or an organism – its fundamental harmony or organising principle. Thamë is fundamental to all understanding of Goddess Religion, because it is before all else the religion of Harmony. In a certain sense Sai Thamë is the opposite of Sai Vikhë: concord as opposed to discord; yet Sai Thamë as the superior principle within the Goddess Religion always rules Sai Vikhë: so the sum of all disorder is the Greater Order. With patriarchy the unbalanced Vikhelic principle is unloosed; and yet, even that disorder, in the great perspective of the Historical Cycle, is but a part of the overall thamë or harmony of being. Sai Thamë rules the music of the spheres and thus all earthly music which is but the reflection of that Primordial harmony. She also rules all things connected with law and government, which within a society ruled by the Goddess Religion are considered to be sacred functions (whereas the term "political" in late patriarchy has become almost synonymous with "Vikhelic"). Some Goddesses-images of Sai Thamë: Justitia, Saraswati as Divine Musician, Our Lady Mary as Queen of Heaven and all "royal" Goddess-aspects. Sai Sushuri is the Divine Love. Since God is Love, Sai Sushuri is God in Her Love-Aspect. Under patriarchy, Venus has often been confused with carnal lust (which is actually an unbalanced Vikhelic tendency). Sai Sushuri is in fact Aphrodite Ouranya – the Heavenly Aphrodite. Sai Sushuri governs every love, from the love of God to motherly love, romantic love, the love of friends and the pure spiritual love of all beings. All love has its Source in Dea, in Her Sushuri-Aspect. She also governs the fundamentally important, but currently much misunderstood quality of Beauty. Sai Sushuri governs the spiritual Path of Love (bhakti marga) and is also said to be the sister of Sai Thamë. Some Goddesses-images of Sai Sushuri: Aphrodite Ourania and every image of Dea as Loving Mother. Sai Rhavë is the last and also the first. In her highest aspect, she represents the Dark Mother – Dea without Form (nirguna brahma) the third Person of the Holy Trinity of the Goddess Religion. On earth, Sai Rhavë rules discipline, restriction and limitation, though she can also govern all that is firm-fixed and settled, thus being a force for stability. It is part of her apparently contradictory nature that she is also seen as a destructive force. 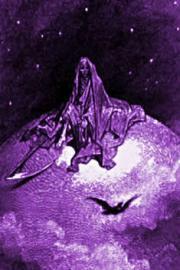 Sai Rhavë is a necessary part of the sevenfold harmony of Creation, but her worship is not recommended to Western people, especially as an unbalanced-rhavic cult of darkness has entered the Western patriarchal psyche over the last century. Some Goddesses-images of Sai Rhavë: Kali and all "dark" and "crone" goddess-forms. "Goddess Religion" is a term used loosely to denote all worship of Feminine Deity. Because of its ambiguities, we prefer to avoid the use of the term "Goddess" for the Supreme Being Herself. The real meaning of "Goddess Religion" is the worship of those Eternal Aspects of Dea that are correctly termed "Goddesses". By understanding these Seven Divine Powers, we are able to understand the many different representations of Dea. As we have seen, a particular Name of Dea (such as Our Lady Mary) may manifest different Janyati at different times, but understanding the Seven helps us to understand both the world about us and She Who made it. Each of these Goddess Forms is Dea at the highest level. That is why we may rightly speak of a Goddess Religion. An excellent modern example is the religion of Durga, in which Sai Vikhë is worshipped and recognised by many as the sole, supreme Deity. 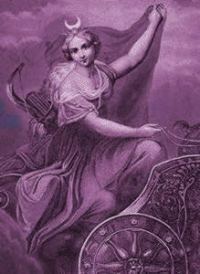 Each Goddess-Aspect is, in Her ultimate Essence, Dea Herself, and may thus form the basis of a true Goddess Religion.